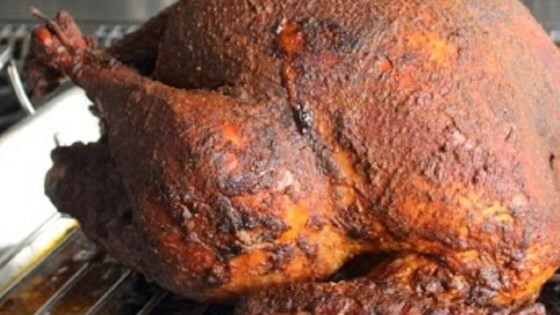 "This is one of the juiciest and most flavorful turkeys I've ever made! The rub forms a crust that locks in all the juices, even in the driest part of the breast meat. I served some of it plated up with sweet potato chunks and black beans and some of it covered with rich pan gravy." Pat turkey dry with paper towels. Loosen skin over each side of breastbone with a spatula inserted beneath skin. Place cumin, soy sauce, vinegar, vegetable oil, garlic, paprika, black pepper, smoked paprika, and oregano into a blender. Blend spice rub into a thick paste, about 1 minute. Set aside 1/2 cup of rub in a bowl for a later step; pour remaining rub all over turkey and use a spatula to work about 2 tablespoons of mixture beneath the loosened skin on each side of the breast. Rub the mixture over every nook and cranny of turkey. Let turkey stand for 1 hour at room temperature. Preheat oven to 325 degrees F (165 degrees C). Fold a piece of aluminum foil into a rounded piece about the size of the turkey breast; set foil aside. Place turkey onto a rack set in a large roasting pan. Tie legs together at the bottom with a piece of kitchen twine. Spread 1/4 cup of reserved wet rub into cavity of turkey; retain remaining 1/4 cup for later. Sprinkle entire top and sides of turkey with kosher salt. Roast turkey in the preheated oven for 1 1/2 hours; place foil tent on turkey breast. Return to oven and continue to roast for about 1 hour and 15 more minutes. Combine remaining 1/4 cup of spice rub with 1 tablespoon vegetable oil and water in a small bowl. Brush mixture over turkey's top, legs, and sides. Roast until until an instant-read meat thermometer inserted into the thickest part of a thigh, not touching bone, reads 170 to 175 degrees F (75 to 80 degrees C), about 30 more minutes. Transfer turkey to a serving platter and let rest for at least 20 minutes, reserving drippings in roasting pan. Place creme fraiche, chicken broth, lime juice, jalapeno peppers, and cilantro into a blender and blend until smooth. Pour excess grease out of turkey roasting pan, pour in creme fraiche mixture, and place the roasting pan over a burner set over medium-high heat. Scrape the browned pan drippings into the sauce mixture, bring to a boil, and cook until gravy is reduced by half and thickened, about 10 minutes. Whisk often to prevent lumps. Season gravy with salt, black pepper, and cayenne pepper. Carve and serve turkey with pan gravy. A flavorful wet rub creates a gorgeous crust that locks in juices. Roasting time is about 15 minutes per pound, or a total of about 3 hours for a 12-pound turkey. Mine was about 13 pounds. Wanted Something different for Thanksgiving and did a trial run last week with a chicken. This recipe was awesome, using it again today with the turkey. Outstanding. Do not skip the creme fraiche gravy. Tried this recipe this weekend. It was delicious! extremely flavorful; received many compliments. the gravy was amazing too, would go well with almost anything!